As of September 2017, we have discontinued the use of Multicraft for our Minecraft: Java Edition servers. You should have some emails from us with specified details, so feel free to check your inbox (and potentially spam/junk folders) for that! As of March 2019, we have discontinued the use of Multicraft for all of our Minecraft servers. Multicraft is now only be accessible to legacy bare metal customers with the appropriate licensing. With years of game server hosting behind us, our development team set out to create a control panel that offers users an all-in-one, one-of-a-kind experience. This mindset brought us Prisma, a fully custom control panel built entirely from scratch. Even better, we focused on much more than just offering an all-in-one experience. We collected piles of feedback to ensure our panel contains all the features every server owner deserves. With Prisma, you'll find that you're able to control your server with ease and immense flexibility. If you try things out and there's anything you feel you're missing out on, let us know! We openly accept feedback and push updates frequently to ensure your Prisma experience is nothing less than remarkable. Our team is proud to say that we are one of the only Minecraft hosts out there with a fully custom panel that is actually rather amazing. We truly hope you'll agree and grow to love it as much as we have! How do I manage my server in Prisma? Email address: The email address used in the billing area of our website. Password: The password you set for the client area (not Multicraft). Coming from Multicraft and forgot your password? If you have not yet accessed Prisma and have forgotten your client area password, you can either reset it using your security question/answer via this form (click here) or you may reach out to our team. If you have accessed Prisma before but you've forgotten your password, you may reset it using this link. 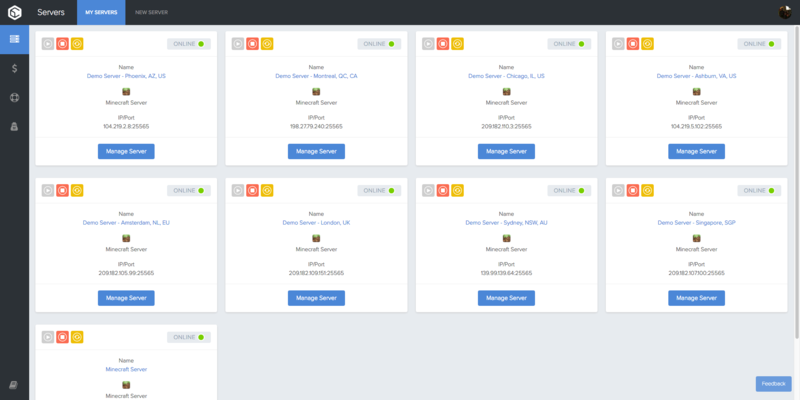 Upon logging into Prisma, you will be brought to a dashboard that shows your active servers, as shown below. Just click on "Manage Server" and you'll be brought to your server's dashboard. As always, if you have any questions about your server, how to do something in Prisma, or anything else, feel free to reach out to our support team for additional assistance. You can do this by opening a conversation using the blue button in the bottom-right of the website.